Grilled tuna steaks are wildly popular on menus throughout the United States, but making them at home can be a little bewildering. Often a homemade grilled tuna steak is dry on the outside, overly fishy on the inside, and not quite the same experience that you have at a restaurant. There are a few key things to consider when making your own grilled tuna at home, including what type of tuna is best to use, and how to marinate your fish to ensure that it has optimum flavor. Tuna is traditionally sold in boneless steaks that are sliced from the loins of the fish. Sometimes you will see a large red coloration, which is the bloodline, and this should be removed before you grill. Five different varieties of tuna are available for purchase in the United States. Each provides a different flavor and texture. Yellowfin: Yellowfin tuna is one of the best tasting fish on the market. It has excellent texture and a flavor that isn't overly fishy or fatty. Bigeye: This type usually reserved for sushi, but doesn't tend to fare as well on the grill. It has the most intense tuna flavor out of any other variety. Bluefin: Bluefin is difficult to find fresh, which means you will have to purchase it frozen. Therefore, it is going to remain a bit rubbery and fishy. Albacore: Usually reserved for canning, fresh albacore tends to get dry and bland when grilling. Skipjack: A fatty tuna, skipjack is the least favored of all tunas for grilling because it has a strong tuna flavor and a greasy finish. When preparing tuna steaks the most important step to ensuring delicious flavor is to marinate the fish in extra virgin olive oil prior to grilling. The flavor combinations are endless, and tuna takes well to most styles of cuisine, so you can tailor the marinade to go with a specific side dish or a dinner theme.Marinating tuna tenderizes the outside of the tuna by coating the strands of protein. This allows the grilled steak to feel moist in the mouth despite the fact that grilling dries out the exterior. In a gallon-sized zipper-lock plastic bag, place the tuna steaks and olive oil. Seal and refrigerate about one hour. Prepare grill to medium-high heat, rub grates with oil-dipped paper towels to help keep the tuna from sticking. Remove tuna from bag, season each side with salt and pepper and grill on one side until it is well-seared. You will know when it is ready to turn because the tuna will no longer stick to the grates. Flip the steak over and grill on the second side about one to one and a half minutes longer. Serve immediately. Place the tuna steaks and olive oil in a gallon-sized zipper-lock plastic bag. Seal and refrigerate about one hour. Remove tuna from bag, season each side with salt and pepper. Place the steaks on the grill and cook until well-seared, about 2 1/2 minutes. Flip steaks over and grill until fish is rare or medium rare, about 3 to 4 minutes. Serve immediately. Either of these marinades work beautifully with the meaty texture and flavor of tuna. You can switch out ingredients if you can't find or don't have something on hand, and try experimenting with your own ideas. Note that each of these marinades works for about 2 pounds of fish. Adjust accordingly. 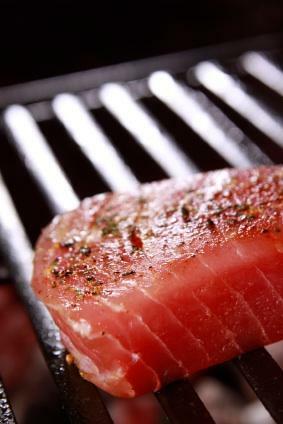 The most important thing to remember when grilling tuna steaks is to choose the very best and freshest fish available. If the fish is old, or previously frozen it will taste fishy and the texture will be mealy. Ask your grocer or fishmonger how fresh the tuna is and don't compromise if it is more than a couple of days old.